Product prices and availability are accurate as of 2019-04-23 15:02:19 UTC and are subject to change. Any price and availability information displayed on http://www.amazon.co.uk/ at the time of purchase will apply to the purchase of this product. 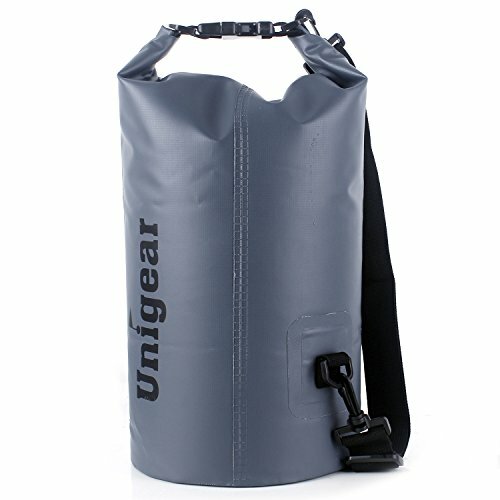 Fishing UK Shop are proud to stock the excellent Unigear 2L/5L/10L/20L/30L/40L 600D Dry Bag Sack with Waterproof Phone Case and Long Adjustable Shoulder Strap for Boating, Kayaking, Fishing, Rafting, Swimming, Camping and Snowboarding. With so many on offer these days, it is good to have a brand you can trust. The Unigear 2L/5L/10L/20L/30L/40L 600D Dry Bag Sack with Waterproof Phone Case and Long Adjustable Shoulder Strap for Boating, Kayaking, Fishing, Rafting, Swimming, Camping and Snowboarding is certainly that and will be a great buy. For this great price, the Unigear 2L/5L/10L/20L/30L/40L 600D Dry Bag Sack with Waterproof Phone Case and Long Adjustable Shoulder Strap for Boating, Kayaking, Fishing, Rafting, Swimming, Camping and Snowboarding comes highly recommended and is always a regular choice for lots of people. Unigear have added some great touches and this equals good value. Unigear aims to produce the very best feasible items for our clients. We enjoys our clients as well as our focus on customer experience, We never ever quit improving on our items, we truly wish everyone appreciate your outside's life ?. LIGHTWEIGHT & HEAVY-DUTY: Made of industrial grade 600D PVC tarpaulin. Scratch, tear and puncture proof. ABSOLUTE WATERPROOF: Providing reassuring protection for your phone, camera, clothes, documents and other valuables from Water, Sand, Dust and Dirt. ADJUSTABLE SHOULDER STRAP: Single strap for 2L,5L, 10L, 20L; Double padded straps for 30L, 40L (backpack style). Comfortable for carry and transport. WITH PHONE CASE: Coming with a waterproof/snow-proof/dirt-proof touch-friendly phone case which fits all smartphones up to 6.0" screen size, credit cards and other small gadgets. 100% MONEY-BACK GUARANTEE: Up to 180 days quality insurance, full refund for your return. Any enquiries welcomed!